When was the last time you received an unexpected service or treat? Perhaps your favorite restaurant gave you an appetizer on the house or the local baker you frequent gave you a free pastry “just because.” Did it put a smile on your face and make you want to tell everyone you know about the great service you received? That’s how your clients feel when you go the extra mile for them, not just while you’re working with them on a transaction, but before and after as well. It’s the little things you do to show your clients you care that matter in the long run. Show them you want to establish trust. Many agents are only willing to do the bare minimum to turn a lead into a client; you’ll stand out by going above and beyond expectations. Call them to touch base and just say “hey,” or send a personal note to tell them you enjoy working with them. Additionally, just listen to them. Listening not only shows respect, it also helps prevent frustration and anxiety once the process starts. Find a need to fill. Your clients may not ask you directly for the name of a good roofer or gardener, but if you hear they need one, connect them with the best ones you know. Even if they don’t choose to work with one of these businesses, they’ll appreciate that you thought enough to refer the businesses to them. View problems as opportunities to leave a positive impression. Whether you’re new to the business or have been in real estate for decades, you know problems can and will arise at any time. Luckily you have the expertise and experience to handle any challenges like the professional you are! Your clients on the other hand, don’t have the knowledge and experience with the real estate process that you do; for them, every challenge is amplified when things aren’t going as expected. Phrases such as, “This is not unusual” or “We’re staying on top of it” will reassure your clients that you have their best interests at heart and know what you’re doing. As you get to know your clients better, you will be able to deliver a more personalized service. This is anything from delivering a pop-by housewarming gift to a client who just finished moving to giving a seller a personal checklist of things to do before their home hits the market. Nowadays, people can find all the information they want with the click of the mouse. However, most people may not have the experience to process all the information they find. Giving them a monthly marketing flyer that provides information about a topical subject will satisfy your clients’ thirst for knowledge and reinforce your character and expertise. 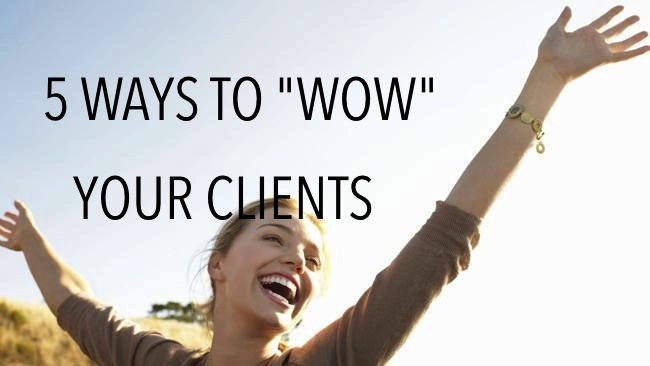 When you offer your clients great service, they’ll likely become clients for life. And when you have clients for life, you’re sure to have a consistent stream of referral too!